I am a teacher. My students are very clever. They study English with great pleasure. Слова I, my, they – это местоимения. 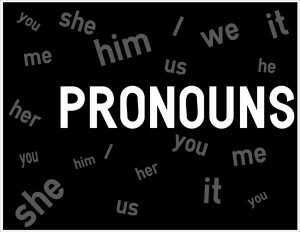 The pronouns are the words that replace a person, a place or a thing. The boy (noun) likes to play baseball. = He (pronoun) likes to play baseball. Jane put on Jane’s (name) hat. = Jane put on her (pronoun) hat. Mom made the child (noun) a toast. = Mom made me (pronoun) a toast. К местоимениям относятся слова: I, my, she, your, him, them, us, her, they, we, he. Jane is going to the zoo. = __________ is going to the zoo. George is dreaming. = _________ is dreaming. The blackboard is green. = ___________ is green. The posters are on the wall. = __________ are on the wall. The dog is running. = __________ is running. My mother and I are watching TV. = _____________ are watching TV. Sally is going to Ann. = Sally is going to him / her / me. Open the window = Open it / them / us please. Can you tell the people the way to the airport, please? = Can you tell you / them / us the way to the airport, please? The books are for Peter. = The books are for him / her / you. Can you help my sister and me? = Can you help her / me / us? Thanks for picking he / me / she up, Dad. Jane wanted Kate to follow he / I / her. He saw us but we didn’t see he / we / him. We found the islands. We found they / them / it. I don’t eat tomatoes because I don’t like __________. George is a very nice man. I like ________. This jacket isn’t very nice. I don’t like __________. This is my new car. Do you like _______? Mrs Clark is not very friendly. I don’t like _______. These are my new shoes. Do you like __________? I want the book. Can you give it to _________? He wants the key. Can you give it to _________? She wants the keys. Can you give them to ________? They want the money. Can you give it to _________? We want the photographs. Can you give them to ______? You want the letters. I can give them to __________. а) Мне не нужна эта книга. Можешь ее забрать. б) Это письмо не для меня. Оно для тебя. в) Мы собираемся в кино. Не хочешь пойти с нами? г) Где моя газета? – Ты на ней сидишь. д) Можешь отдать их Роберту? е) Кто эта женщина? Почему ты на нее смотришь? ж) Я не пойду с вами гулять.